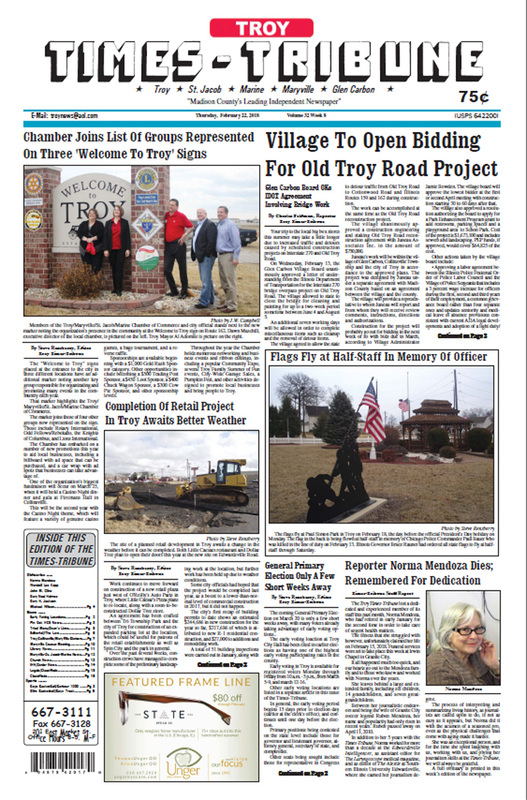 The February 22, 2018 edition of the Troy Times-Tribune is available! Some of the headlines in this issue: Village to Open bidding for Old Troy Road Project, Chamber Joins List of Groups Represented on Three 'Welcome to Troy' Signs, Reporter Norma Mendoza dies. Completion of Retail Project In Troy, Knights Win MVC Road Game Against CM Eagles, Stokes Finishes Fourth at State in Bowling; plus we have an editor's column, our “It Happened Here” history page, police blotters, news about upcoming events, and lots more!